The sheer performance of today's leading components is incredible, but what's arguably more impressive is how modern CPUs and GPUs can deliver such thrills in tiny packages that are far more efficient than previous generations. An obvious upside to that trend is that today's phones, laptops and desktops can be smaller yet more powerful than what came before. Lots of sharp angles? Check. Plenty of RGB lighting? Check. An outlandish price tag? Check. 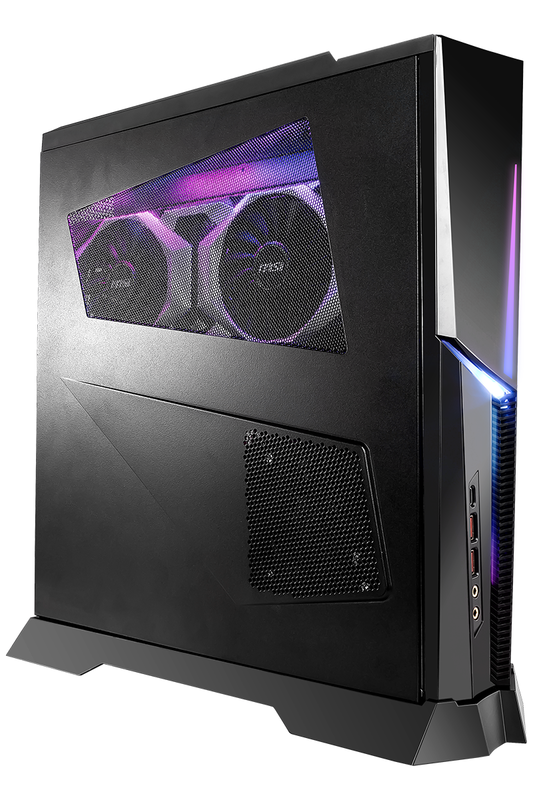 At £2,699, Trident X 9th has many of the hallmarks of a modern high-end gaming PC, but can rightfully claim to be smaller than your average tower. Dimensions of 130mm (W) x 383mm (D) x 396mm (H) aren't quite as small as, say, an Xbox One games console, yet as far as gaming PCs go, Trident X 9th is suitably small. Carrying the sub-7kg chassis from one event to another shouldn't be a burden, and if you're hoping to save space, this is a fine way to downsize from a traditional case. 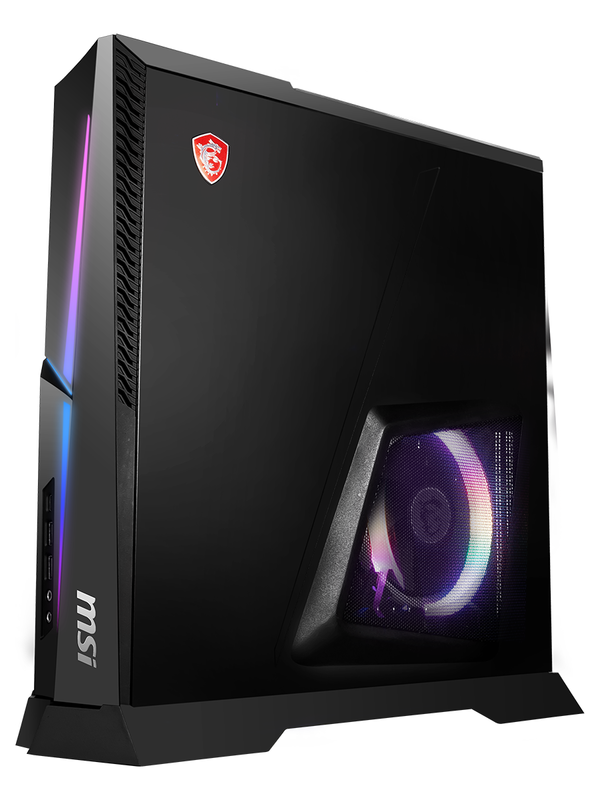 Having a smaller footprint is all well and good, but at this price point, MSI needs to deliver a serious performance punch. 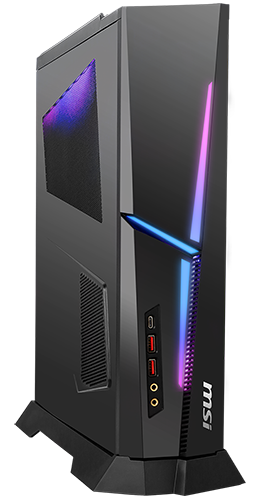 To that end, Trident X 9th comes equipped with an eight-thread Core i7-9700K processor cooled by a low-profile heatsink and fan, a huge 32GB (2x16GB) of DDR4 memory, a 512GB M.2 SSD and GeForce RTX 2080 graphics. A tasty fusion of modern tech, but said components don't necessarily conform to our expectations of a £2,699 machine. 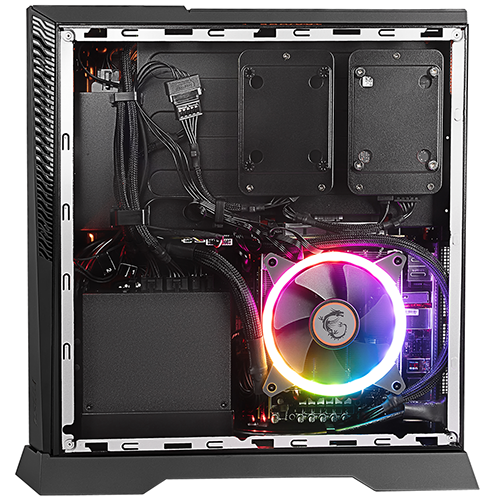 Indeed, even if you factor in the secondary 2TB hard disk, a 650W SFX power supply and the MSI Z370I Gaming Pro Carbon AC motherboard, value for money isn't one of the Trident X 9th's strengths. 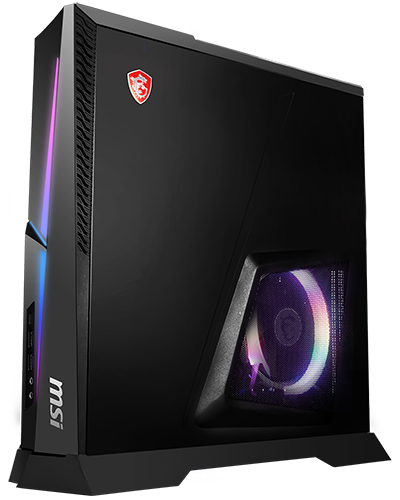 Going purely by CPU and GPU specs, it's possible to pick up a PC of this performance grade for under £2,000, so there's a hefty price premium for MSI's petite integration. It's a shame the price tag is so excessive, as this is otherwise a very likeable PC that doesn't skimp on features irrespective of its size. The front of the unit is home to all of the connectivity options you'd expect - USB 2.0 Type-A, USB 3.1 Type-A, USB 3.1 Type-C, as well as a pair of audio jacks - and all of the mobo and graphics card ports are easily reachable around back. Better yet, the MSI motherboard offers integrated Intel Wireless-AC 8265 connectivity - handy when wired just isn't an option - and the graphics card is an RTX 2080 Ventus OC, meaning a factory overclock of 1,800MHz. 32GB of memory might be overkill, but MSI's component selection is for the most part sensible, and though the chassis design won't be everyone's cup of tea, it looks better in person than it does in the photos. 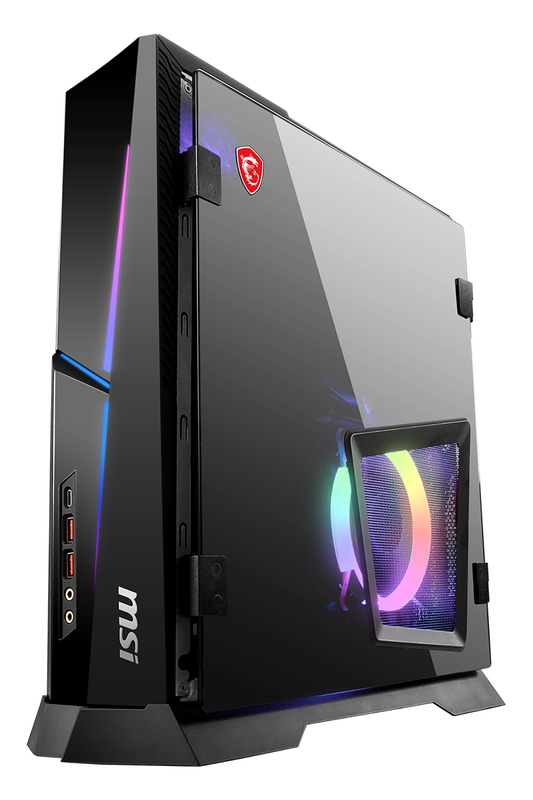 The RGB lighting effects are well synchronised and easily managed via the software utility (don't worry, they can be turned off if need be), the mesh sections do a good job of showing off the hardware while aiding airflow, and if you do prefer a more glamorous rig, MSI includes an optional glass side panel as part of the bundle. 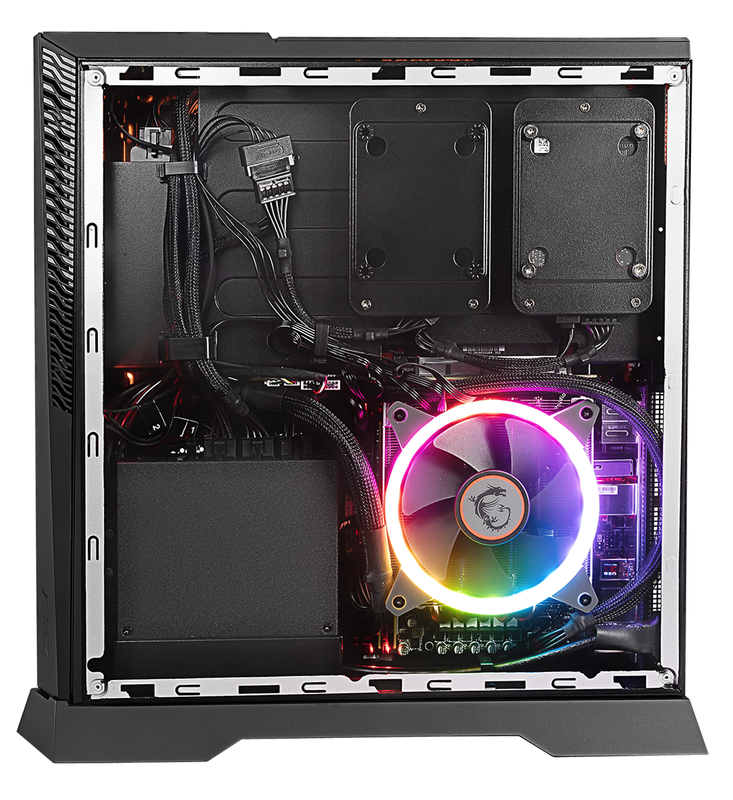 We like the fact that the modular power supply has been integrated to save on external clutter, and easy access to the main components means that CPU, GPU, memory and storage upgrades are relatively painless. What's missing? 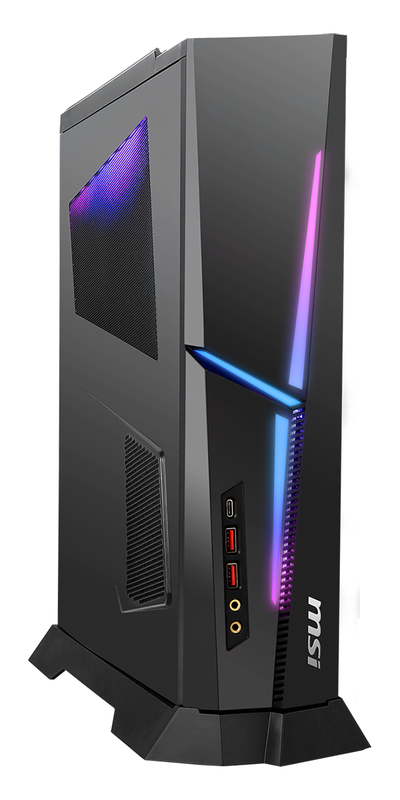 Well, from a component perspective, we'd liked to have seen MSI mirror the Corsair One by including liquid cooling as standard, as fan noise is quite noticeable when the going gets tough, and if we're nitpicking, a hardware button to disable the lights wouldn't go amiss. It is also worth pointing out that, unlike the less powerful Trident 3, Trident X 9th is designed to be stood vertically at all times. Though the bottom stand can be removed by undoing a set of screws, placing the chassis horizontally would cover either the CPU or GPU vent, and isn't recommended. A shame, really, as a horizontal placement option might have made the system more viable in the living room. Outside of hardware, we're not surprised to find that MSI is continuing to load its systems with superfluous software, however offenders such as PowerDirector and Norton Security are easily removed. All things considered, the lofty price tag is ultimately our primary concern, but let's run through the benchmarks before passing judgement.